← Happy No-evo year 2018! = Feliz año No-evo 2018! A remarkable artistic show takes place in La Paz. The presentation of a sample of large wooden sculptures made by Bolivian artists, who mostly do not like to appear with their names, but only show the icons translated into cultural production that can be made with wood of different varieties. Indeed, to present this page with the art that can materialize in a material other than its best known possibilities, but the works that are appreciated in the sample proves that wood, apart from being used in furniture and buildings, also has the possibility of reflected in the artifice of beauty, as is sculpture. This beautiful possibility can be seen in the exhibition that is offered in part of Santa Cruz Avenue and the squares, Murillo and San Francisco. Observing it at first glance offers a pleasant surprise. It is common to appreciate wood sculptures but in medium or small size, but this time its authors have shown that it can also be concreted in larger dimensions, of approximately one and a half meters. In that dimension it is difficult to imagine that a sculpture could be designed, but our artists have managed to do it, with the fact that their authors are not even identified. Their generous artistic spirit is what they have set out to show and they have achieved it with flying colors. 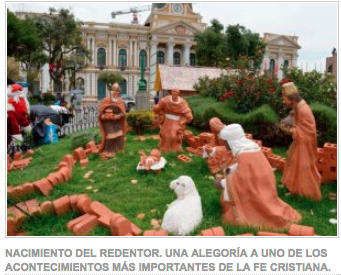 This entry was posted in Art, Bolivia, Holidays, La Paz, Tourism and tagged bolivian Christmas decorations, Catholic Church. Bookmark the permalink.